265 p., 14,7 x 20,8 cm. In cooperation with Hermann Beland, Ilse Grubrich-Simitis, Ludger M. Hermanns, Albrecht Kuchenbuch, Edeltrud Meistermann-Seeger and Horst-Eberhard Richter. 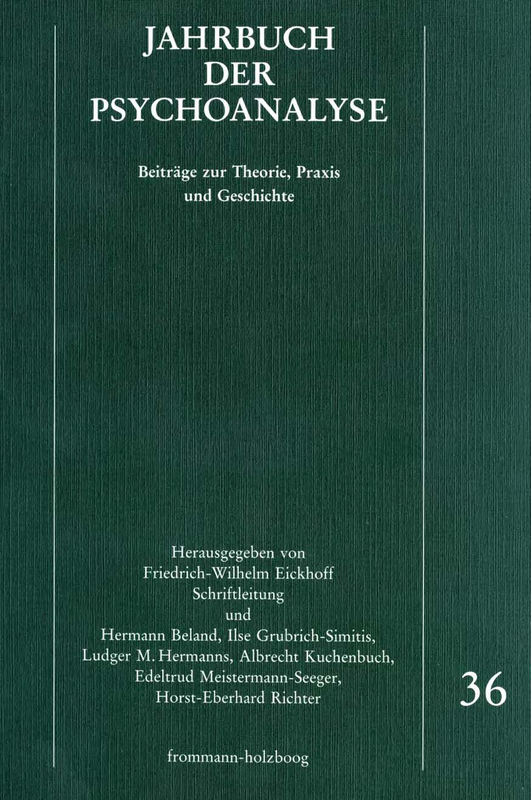 With contributions by Peter Dettmering, Karin A. Dittrich, William I. Grossmann, Wulf Hübner, Joachim Küchenhoff, Elsbeth Schmidhäuser, Sieglind Schröder and Samir Stephanos. The author discusses the ways in which psychoanalytic theories, like other theories, attempt to systematise the understanding of observations. Freud remarked that systems also have unconscious meanings. The author discusses these unconscious vicissitudes of psychoanalytic theories of both clinical and more abstract kinds, at various levels of psychological function. Learning psychoanalysis repeats in some respects the developmental processes of learning about ›reality‹. The role of authority and superego function in learning and utilising theories is emphasised. The enduring unconscious relationship of theory t o authority contributes to adherence to, misapplications of, and rejection of theories, as well as to anti-theoretical attitudes. The concept of an ›analysing instrument‹ illustrates the way in which a useful exploratory idea may acquire prescriptive and constrictive implications. Analysis of the analyst’s attitudes towards theory and its applications is an aspect of countertransference analysis. The linguistic-analytic reflection of Freud’s distinction between conscious and unconscious mental states may give the reason for the anthropological foundation of analytical therapy. The significance of linguistic expressions for mental states is from the ego-perspective (from which they are directly known, their consciousness exists in the expression spoken in words) and from the observer-perspective (from which the existence of the actual state can only be concluded indirectly due to the person’s behaviour expressed in his body language) is identical. In case of unconscious mental states no spoken utterance in words of the person corresponds to these from the ego-perspective; quite the contrary: what the person says about his mental state is not covered by what others may perceive. The difference between unconscious self representation using body language and conscious self representation using words constitutes as a human condition the analytic situation as a dialogue. In it the attempt is made to join what had to be separated in the early dialogue of words and body language between mother, father and child, between expression (message) and perception (feeling addressed). For on the way to gradually finding (words) language, a process of becoming conscious, mental states whose becoming conscious would be to much for the mental organisation for the child may not be expressed with the appropiate words, they remain repressed in the unconscious, may reveal themselves as a symptom in behaviour. Because of the asymmetry between the mental capability of the child and the conscious and unconscious mental ability of the adults repression as the reaction of the child to the »mysterious message of the adults« (Laplanche), is a human condition too. We treat patients who carry sustained traces of traumatizations from their early life histories in themselves. They are marked by a specific contact disturbance which is produced by the convergence of the patient’s isolation and the environment’s indifference. The pathognomic clinical picture (Befund) of these patients is introduced as »devitalisation in the object relationship«. At the centre of our therapeutic concept stands the »conference on episodes«. The psychoanalyst tries, on the basis of an episode - a seemingly minor event on the therapeutic encounter - to emphasize with the patient’s life history and starts to outline it. The psychosomatic pathology and the construction of the life history are exemplified by means of a clinical vignette. The therapeutic process, following a pattern of five steps, is started by the construction, continued and carried by the creative narrative of the patient. Dealing with early traumatized patients requires an attitude on the part of the therapist which is marked by sensitivity and inner strength. The ancient Egyptian myth of Isis and Osiris serves us as a constructive frame work of therapeutic ethics. The five steps of its course correspond with the steps of the therapy. Freud’s »Mourning and Melancholia« is a transitional text, leading from drive to object relations psychology. In the present paper it is argued that Freud’s concept of mourning stays within the limits of drive psychology where as the concept of melancholia already considers the vicissitudes of object relations, esp. of introjective processes. Applying the method of immanent criticism, the concept of mourning is critized by the concept of melancholia and is reformulated. The concept of melancholia is important not only for the understanding of depressive illnesses, but also of other severe psychic diseases; this is illustrated by two case reports on the therapy of a phobic and a psychosomatic patient. Concluding the paper, the relevance of »Mourning and Melancholia« for sociological analysis is considered by commenting on the latest debate on Mitscherlich’s book on »The incapacity to mourn«. Brahms composed his op. 53 in a time of deep discord between him and Clara Schumann. For his composition he used a part from Goethe’s »Harzreise im Winter«, a poem, that shows the author’s recovery from a psychic crisis. As a mediator of consolation music is mentioned in the poem. We try to show, by which ways of consolation the poet and the composer let participate reader and listener in the psychic calming down. can be traced into a deep layer of the work in which the contrasts of envy and gratitude (Melanie Klein) are of foremost importance. Franz Kafka experienced an extraordinary rise in production in the second half of 1914 after breaking off his first engagement. Hellmuth Kaiser analysed as early as 1931 the narrative »In the Penal Colony« (»In der Strafkolonie«), written at the same time as the novel »The Trial« (»Der Prozeß«), and gave great space to the »currents of the unconscious«, while limiting the consciously pursued sense of the story to only a few sentences; according to him Kafka’s writing virtually served practical action, it experimented with the solving of life problems. Philological research too has meanwhile acknowledged this aspect of Kafka’s work; yet it refuses to this day to consider the psychoanalytically relevant perspective, especially evident in the »Penal Colony«, in its deliberations. This paper is attended to allow philological and psychoanalytical aspects to come into their own and to show, while including the novel »The Trial« (written at the same time) and some biographical details, that Kafka for the most part consciously absorbed the currence of the unconscious into his writing and thus risked a self exposure. With the distance of a strict stylistic form he confronted his own psychic conditions, whose fundamental fateful presence he believed he was able to determine in the whole jewish generation of sons to which he belonged. This problematic psychic situation is based on a conflict between the vital authoritarian father and the intellectually superior son, desperately searching for his masculine identity. In the »Penal Colony« the psychic forces of the son affected in this way are personified in allegorical figures. The main characters of the story, namely the travelling scientist as the intellectually superior ego of the person and the officer as an obsessive artist of persuasion and super-ego, attempt a rebellion and defense against jewish sexual morality which had the power of law. The ego resists the super-ego. The condemned within the person is free from his chains. The consequences are made visible. Thus seen the »Penal Colony« becomes vindications of Freud’s preliminary analytical work and is also the attempt of a seeing and suffering human being, to take control of his own life against himself and society. Starting with the public discussion between Sigmund Freud und Leopold Löwenfeld, a very renowned neurologist of the time, in 1895, the further scientific exchange and friendship between the two men - a basis for the early reception of psychoanalysis in German specialist circles - the stations of the dissemination and institutionalization of psychoanalytical thinking in Munich are described: Munich psychiatry under Emil Kraepelin as a controversial forum and training centre of subsequent psychoanalysts such as Ernest Jones, Edith Jacobson, Wladimir Eliasberg, Karl Landauer und John F. Rittmeister; the foundation of the first Munich local group by Leonhard Seif in 1911 and its activities until the outbrake of World War I; the psychodynamics of the 4th psychoanalytical congress in Munich in 1913, which split the Munich group and resulted in the reforming of an Adlerian group in the early twenties; finally Freud’s failed attempt to create with Eugenia Sokolnicka a new psychoanalytical base in Munich.